I noticed this tiny detail on the urban landscape the other day. Outside the new university buildings on Karen Blixens Vej. I noticed it because I was heading up onto the sidewalk to park. Scanning the curb for the lowest point while cycling is one of those tiny bits and pieces of behavourial wayfinding that we never give much thought. On certain stretches on my regular routes I know exactly where the lowest point is so I can life the front wheel and bounce onto the sidewalk. Outside our corner shop, for example. 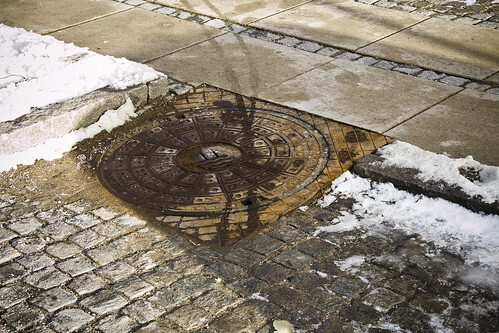 Anyway, my subconscious scan revealed this ramped manhole and I used it. Seconds later, still rolling towards the bike racks, I realised that it wasn't a flaw. The streets are quite new outside these rather newish buildings. Yes, we still cobblestone wherever we can. Charm, character, tradition. I parked and went back to the manhole. It was simply designed this way in order for bicycles to get up onto the sidewalk more easily. Once again, it's in the details. Master planning is great. Designing new initatives for bicycles is great. But this one little manhole on this one little street. It was tilted for bicycle wheels. Left me wondering. Was this a detail that was funnelled down all the way from the planners or was it the men who laid the cobblestones and slabs and curb who made an inspired impromptu decision? The slabs had to be cut to fit and that's usually done on the spot. Urban mysteries. Let's not omit the possibility that it was shoddy workmanship that turned into a coincedental bonus for cycling citizens. 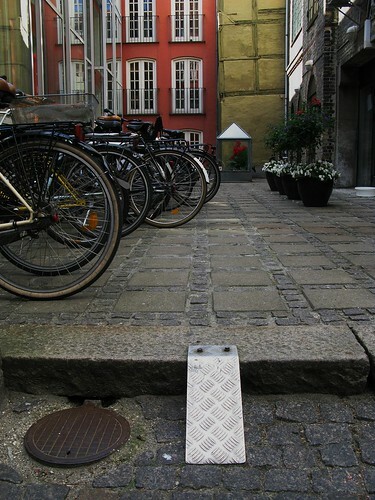 Like this little bike ramp I spotted in a courtyard in the city centre. Some flats but mostly offices. A long line of bike racks with this little curb in the middle. Someone went to the trouble of screwing a bit of metal into the stone merely to make a fraction of time in peoples' day a little bit easier. It's only ten centimetres. Easily hoppable, but no, no. A ramp. Splendid. And this is a private courtyard so someone - a resident? an employee? - got the idea and passed it along. Presto. 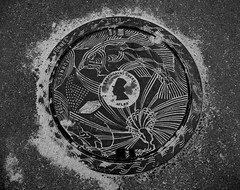 Back to manholes, when the hell am I ever going to get the chance to wangle an a propos about manholes and give my excuse to blog my manhole photos?! It ain't everyday. Like this one. Telling the story of The Steadfast Tin Soldier, the Hans Christian Andersen fairytale. As seen out at Amager Beach.